Stay with a local Mexican family to experience full cultural immersion during your studies with the Guadalajara Langauge Center Homestay program. Set your family preferences on our application form and we will allocate an appropriate family for you. They will provide 3 traditional meals a day, private room, helpful information and of course a great opportunity to practice the Spanish you have learned at the school. In Mexico the main meal is the lunch which is at around 2 pm. This meal is a meal that in a lot of countries will be seen as dinner. The breakfast can be heavy like eggs, chilaquiles etc. Be aware that the evening meal is often not eaten together and is normally very ligth. Most of the time this will be coffee, sweat bread or just fruit. All Homestay families are within walking distance of the school. Placement confirmation and contact details will be forwarded to you prior to your arrival. Below are our different homestay options. 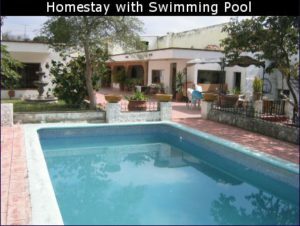 Your homestay option can be chosen on our online application form by selecting ‘Regular Homestay or swimming pool Homestay’ as your accommodation preference. The Bustamantes have a beautiful home and family in the heart of Tlaquepaque. Javier and Teresita Bustamante(as shown in the picture gallery below) also have 3 teenage children who will provide plenty opportunity for Spanish exchanges over the dinner table. They also have a lovely swimming poolinside the grounds. Javier and Teresita are very experienced in receiving foreign guests from all over the world – you can read some of our ex-students’ comments below. Clarissa Brunt, Austin, Texas, US.